The United Nations has asked for an extra $55m in emergency funds to care for refugees from Sudan's troubled Darfur region who have reached Chad. The existing 2004 budget of $20.8m is inadequate to care for the 200,000 people expected to receive care in UN camps, the refugee agency said. One official said a race against time had begun to get people into shelter before the onset of the rainy season. 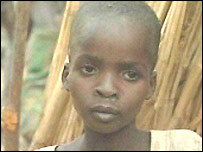 In Darfur itself, half a million children face hunger and disease. More than 93,000 Darfur refugees are now in UN camps but that number is expected to reach 200,000 by the end of the year as people arrive in from the border region, the refugee agency (UNHCR) said. It warned that many refugees were exposed to "protection hazards" including military conscription and "sexual and gender-based violence". The BBC's Hilary Andersson has witnessed harrowing scenes of malnutrition in Murnei, a refugee camp inside Darfur which barely feeds some 80,000 people. She watched as emaciated people received aid supplies after two months without a proper meal. UN Secretary General Kofi Annan has described the situation in Darfur as a "humanitarian emergency of catastrophic proportions". The UNHCR has already received $18m in aid contributions since it began the Darfur appeal in February - less than a third of the new budget. The appeal was launched after an exodus by local black Africans amid raids by Arab militia seeking to crush a regional rebellion. 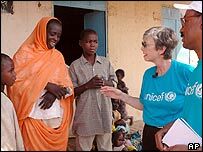 Carol Bellamy, director of the UN children's fund (Unicef), returned from a two-day visit to Darfur to paint a picture of misery and terror in a region where about 1m people are believed to have been displaced. "During my visit to Darfur, it was clear that people are continuing to flee their villages," she said in the Sudanese capital, Khartoum, on Tuesday. "I was struck by stories of women who fled their homes with their children. Many said their husbands were killed." It was now, she said, a "race against time to provide children and their families with basic life-saving services such as clean water, sanitation, nutrition, shelter and health care". "Village after village has been ethnically cleansed"